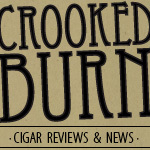 Today's review is for a cigar and brand which, until last week, was unknown to me. 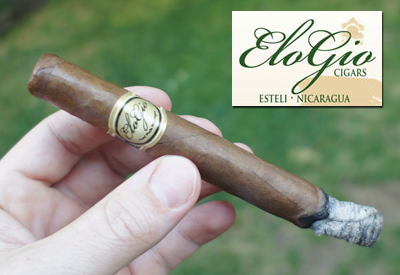 EloGio Cigars is a small company whose products are being produced where I consider the heart of all things cigar-related...Esteli, Nicaragua. It seems EloGio's claim to fame is their Master Blender Carlos Pereda Robaina, who is the grandson of the late, legendary Alejandro Robaina. Info taken from the EloGio Website: We only use select long filler Nicaraguan tobacco grown exclusively for us in Candega, Jalapa, and a exclusive small farm in Somoto. According to their website, the Serie Habano is the newest release in their portfolio. I want to thank Ben from Nice Tight Ash for setting me up with this stick....Good looking out, friend. 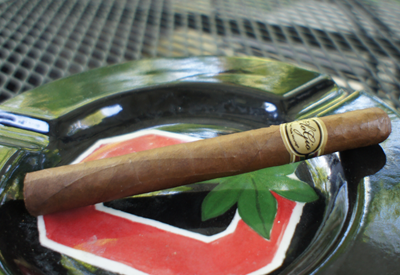 My EloGio Serie Habano was medium brown in color with a few good-sized veins. These characteristics, paired with the very distinct amount of tooth the wrapper had, gave it a somewhat rustic appearance. The prelit aroma was strong and smelled like a combination of raw sweetness and cedar. It was not off-putting in the slightest, but it was very pungent. Like the aroma, the cold draw was also strong and had a floral, red wine taste. The flavor seemed to linger for a pretty fair amount of time, even while unlit. The band...well, it looks like a cheap bundle cigar. I don't know anything about the set up of this company, but I really think some of the smaller guys should spend more time on their artwork. This is a BIG selling point for your cigar...don't let it NOT stand out. My EloGio Serie Habano opened up right away with a lot of flavor. The front of each draw had a powerful, sweet hazelnut taste that gave way to an equally powerful cinnamon spice finish. I was impressed right away by its uniqueness and great flavor. There was a great draw of smoke on each puff and just enough resistance that it didn't feel like you were sucking air. I did have some problems with the burn being crooked and had to touch it up twice. The wrapper seemed to be pretty thin, so correcting the burn was not a big issue. The nicotine strength was in the mild to medium range. 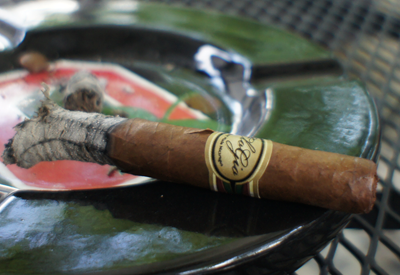 In the second third of my EloGio Serie Habano, the front profile flavors took a huge shift to the darker side. The front no longer had any of the sweetness or hazelnut from the first third, but was now dominated by a charred meaty flavor. I never would have expected it coming from what I experienced in the first third. It was still enjoyable, but a lot different. The finish on the profile stayed the same with a spicy cinnamon, but it wasn't as strong a flavor any longer. The nicotine level now started to creep up into a solid medium level. Burning further into the second third, the finish started to change up again and picked up a floral flavor. 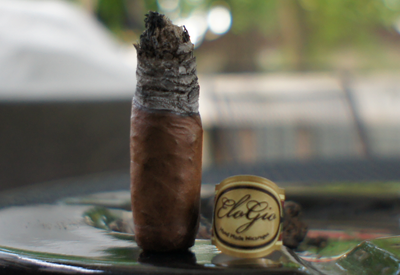 The final third of my EloGio Serie Habano a had a strange, yet nicely balanced, flavor profile. The front was the dark, strong meaty flavor and the finish a light floral, almost potpourri note to it. It sounds like it really wouldn't work, but in this case, it did. I don't think I would've enjoyed it if this were the flavor profile for the whole smoke, but at the end, it was nice. The burn continued to be a little problematic and needed touch-ups, so keep your lighter close. The nicotine level was a solid medium at the end. Final thoughts on the EloGio Serie Habano? 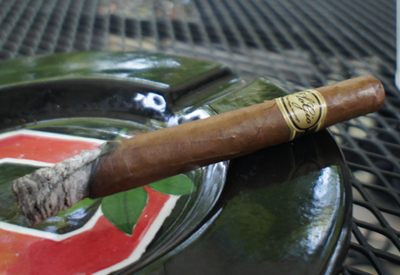 I didn't know what to expect from this cigar, but I am very glad to report that it was a pleasant surprise. The first third was, by far, my favorite part of the cigar, but the second and third parts had enough going on that I enjoyed them also. I recommend looking around for one or two of these and giving them a shot. If anything, the first third is pretty unique and I'd love to hear others' thoughts on it. Would I buy a box?I liked this cigar, but I'm on the fence about a full box. If they were priced right, I think I would at least consider it.